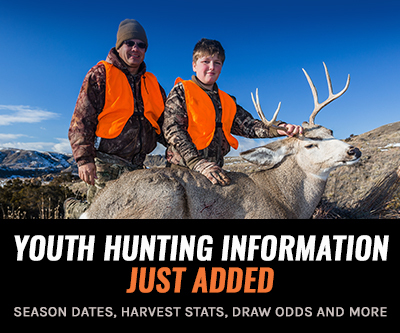 Earlier this month we launched our 2018 Draw Odds Updates and today we are happy to announce that female/antlerless species draw odds are now live on INSIDER! Our goal is to continue to showcase the opportunities that are available in the West, and we aren’t stopping here. We know a lot of people want additional chances to put meat in their freezer, and now you can find the odds of pulling an “antlerless” tag to further increase your hunting opportunities across the West. This is especially useful for hunters who are looking to add another tag in their pocket when traveling to out-of-state hunts. We have female/antlerless draw odds for nine western states. You'll see this newly added section at the bottom of the species list once you click on a state. You’ll see female species draw odds under each state section in the standalone Draw Odds page. Example of the standalone Draw Odds views for antlerless elk in Colorado during the 2nd Rifle season. We have draw odds for the following female species: mule deer, whitetail deer, blacktail deer, Rocky Mountain elk, Roosevelt elk, antelope, sheep, mountain goat, moose, bison, and ibex. At this time antlerless draw odds are only available on our standalone Draw Odds page and not on Filtering 2.0 or the Unit Profiles. You can access female draw odds by hovering your mouse over the word "INSIDER" in the top navigation bar, but don't click anything yet. Then you should see a drop-down screen. Scroll left to the "DRAW ODDS" section and click that. After those steps, you should end up on our standalone Draw Odds page. Or the direct link here. From there, you will select a state and then residency. It will now show you all the female/antlerless options if you scroll down on the right-hand side. Here is the link for Colorado > Nonresident species options for an example. Stay tuned for more updates on other enhancements we are rolling out with during the 2018 application season… we aren’t stopping here! Best of luck in the 2018 draws. As always, feel free to reach out to us at any time if you have questions. If you're unfamiliar with INSIDER, you can read more below. @Gil - Thanks for reaching out. It's on our list of enhancements for next year! Yes, please add to filtering. I'm a meat hunter. Thanks for the comment. You are correct, let me have our tech guys look into why they are displaying the way that they are. Best of luck in the draws! Having a little trouble tracking some of the antlerless stats for MT: For instance, for mule deer does, it looks like you have HD 343/350 combined on the stats page. I don't know if that should be the case. HD 350 had a distinct B license in 2017 (and again in 2018) that wasn't linked to HD 343. Also, there is no HD 370 B license listed. I might be misreading the stats, but wanted to let you know. Trail - makes sense, thanks for the response. We started out with draw odds to gauge the demand and see what the response might be. I would say based on the feedback we will add it to Filtering which will take some development and time, but we will add it in the future. Why not add the antlerless to Filtering 2.0? Paul, thanks for the comment and welcome to INSIDER. We agree adding female seasons to Filtering 2.0 would be awesome. It's something we plan to add later this year. I'm new to Inside 2.0 and I look forward to learning more about the inner workings and seeing further improvements and enhancements as they become available. One of the features that really attracted me to the filtering 2.0 tool in the first place was the ability to see the various hunting districts (HDs) appear and disappear as I applied layers (resident, points, rifle, etc.) which then helped me make a determination as to where I'd have a chance to successfully draw a tag. I would echo other comments (eg. Michael K) as they pertain to the antlerless feature being outside the current filtering 2.0 capability. Yes, I can switch back and forth betw/ screens but this sort of defeats the purpose of ease of use don't cha think? I'd like to see the female draw odds feature made a bit less cumbersome as it pertains to seeing the HDs in a future filtering release. You have a great product here and I'm sure you will continue to make improvements to the user experience. Thanks alot for the follow up Brady! Hope you draw some good tags this year. @Colten - I just got word from the team that Montana doe antelope draw odds have been added! Thanks for the info....found it. From there, you will select a state and then residency. It should show you all the female/antlerless options if you scroll down on the right-hand side. Let us know if you have any other questions. We'd be happy to help. I may be doing something wrong but I cannot find the data for anterless critters for Colorado??? Well there goes my sleeper cow elk hunt that nobody knows about... till now! Hi guys, I just joined Insider right before the Female odds were announced. I’m planning my first western hunt and it will be for doe antelope so I’m excited you added these draw odds. I would like to add my request that they be integrated with Filtering as well for smother research. Just curious if you guys are going to break down more of the units. For example you guys have the cow elk odds for 55A/55B in NM but there are three different units with in that area. Sub units Urraca, Valle Vidal, ES Barker and Colin Neblett. So four but anyways you get what I am asking. Also there is a youth cow hunt in the Valle Vidal too. Just wondering if later this month or when you guys are doing to post those separated hunts. Thanks for the comments. We agree that it would be nice have the female seasons on Filter 2.0 and it's something that we are tosing around here in the office. One of the reasons, like you mentioned, is the season limitations are listed in the Unit Profiles under each season and we don't have those for antlerless.As with everything that we do, we'll continue to improve and add to it. Thanks, we're glad that you like it. To answer the second comment, we have an update coming in about a week that will break the Full Price and the Reduced Price apart. We wanted to get the info out, and couldn't fit it in the original release. For now, if you look at WY Antlerless Elk and see a season with "No Apps" at all point levels except 0 pt, those are the Reduced Price hunts. Thanks again for the comments guys! We love to get suggestions from our members, it's how we evolve the product into what people want. #1, I appreciate you adding this! Hey Cody, we are releasing California and Kansas in 2018, plus some other enhancements. Washington is on our radar and a state we want to tackle, but it won't be until 2019. Are you guys releasing Washington this year? @Colten - Sorry I didn't see your comment last night. The INSIDER team is still crunching on Montana doe antelope. It will be live well before the antelope application deadline. @Josh - If you're still having trouble, you can reach out to INSIDER@goHUNT.com and we can put you in touch with someone to help navigate you through to the female draw odds section. @Cody - At this time female/antlerless odds are only available on the main Draw Odds page and not on Filtering 2.0, the other 2018 Draw Odds Updated article mentioned updated odds (male species only) were available on Filtering 2.0 and Draw Odds. But, once on the Draw Odds page for female species, you do have filtering, minimum draw odds, season options, etc. options to select from. 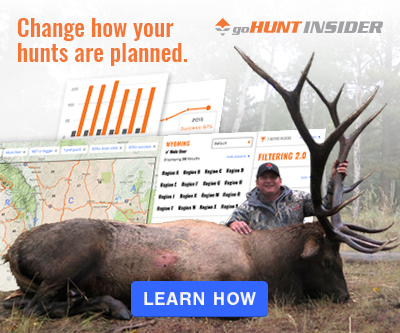 We are constantly taking feedback from our users and are looking at other options for continuing to show more antlerless hunting opportunities on INSIDER so adding them to Filtering 2.0 down the road could be an option. Can't wait to see how you do this season! Am I crazy or didn’t it say it was available on the filtering 2.0 side earlier? 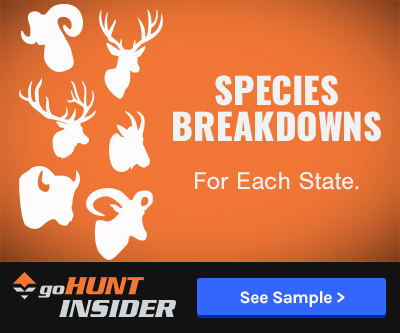 @Josh - Make sure you are looking at the standalone Draw Odds page here: https://www.gohunt.com/draw-odds/ Then select State and Residency, then scroll down and you should see the female species. Let us know if you have any other questions. Maybe I'm on drugs but it isnt working for me either... I checked different states also. I'd be happy to help. If you go here: https://www.gohunt.com/draw-odds/ Then select a state and then residency. It should show you all the female/antlerless options if you scroll down. Thanks Brady, thats awesome, I've been waiting for this for a few years. I asked because i was not seeing the anterless options like i see in the pictures above. Hey Tom. 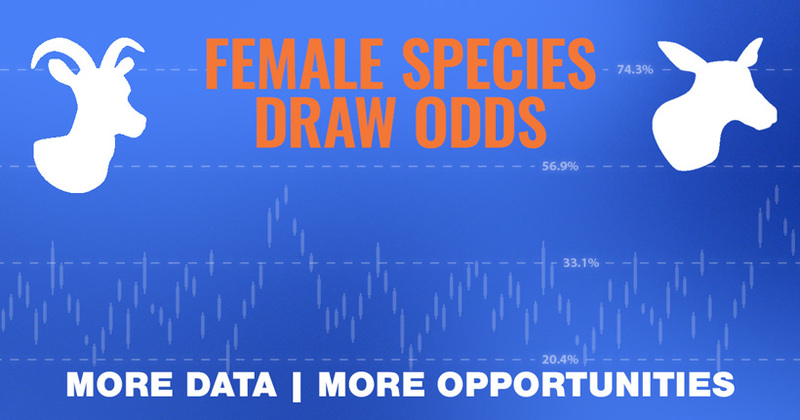 We have female/antlerless draw odds available for every state we cover. So currently we have female odds for Arizona, Colorado, Idaho, Montana, Nevada, New Mexico, Oregon, Utah, and Wyoming. I'm really excited to use these for a few bonus hunts in 2018! What states do you have this for currently?